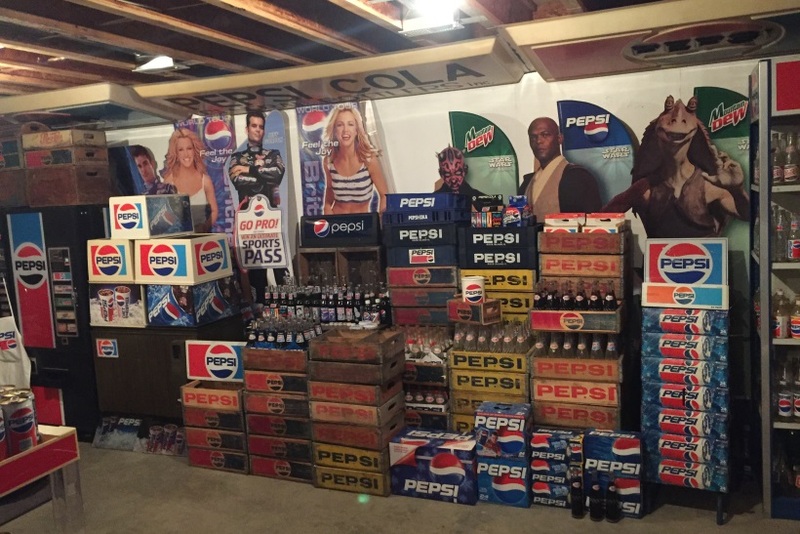 Some people take their work home with them, but not to the extent of this PepsiCo employee. 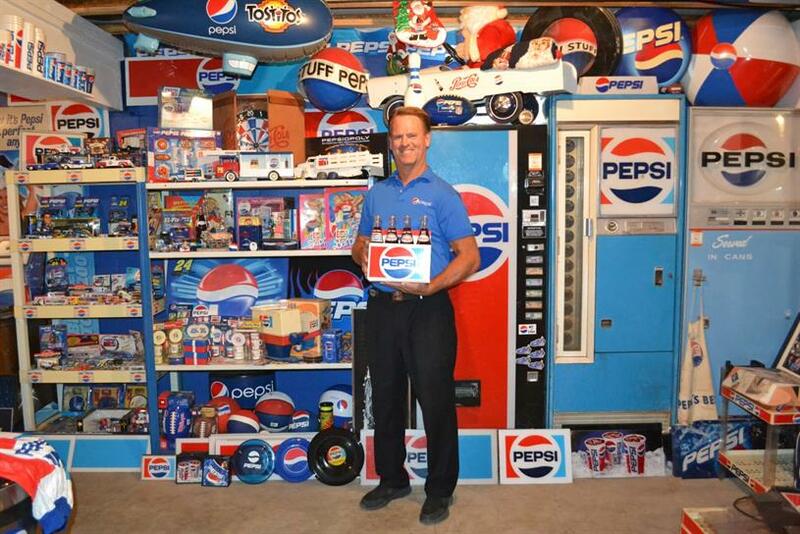 PepsiCo salesman Thad Lents loves his job. He's been a company man since 1993, working his way up from the Pepsi warehouse to become the customer development representative for the Iowa/Nebraska market. 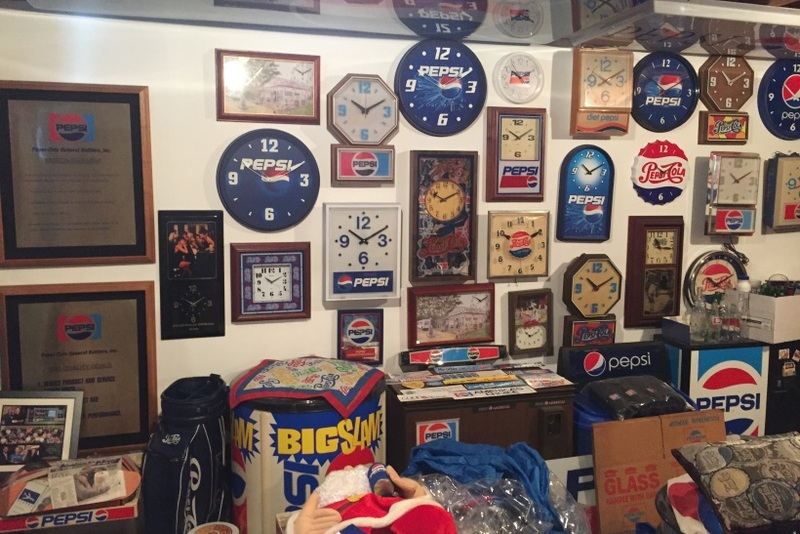 In 23 years, any employee is bound to take some work home, but Lents has amassed enough Pepsi memorabilia to fit a 28-by-32-foot room. "Anything red, white and blue catches my eye," Lents told the local paper Mashalltown Times-Republican. His 5,000-plus piece collection fills what Lents calls his "basement museum." 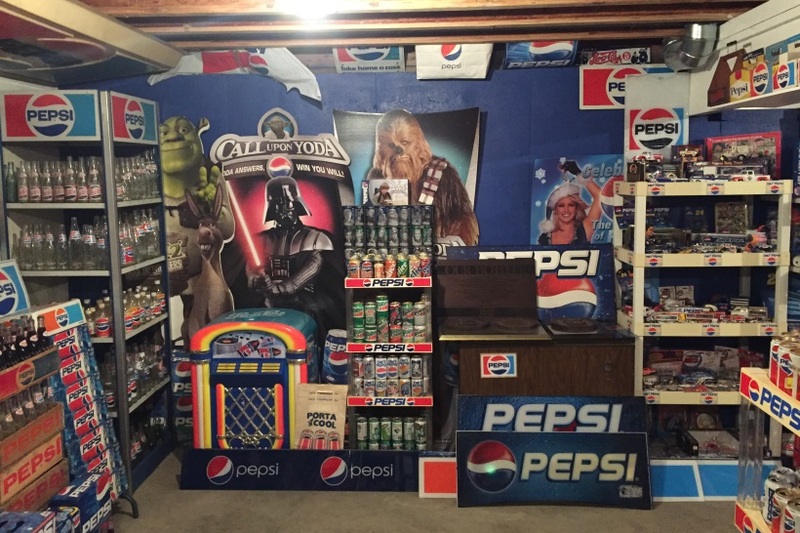 The walls are painted with the exact colors on the Pepsi can, but one can hardly see them as they're covered with cups, cans, bottles, clocks, signs, plates, posters, cardboard cut-outs (of Britney Spears, Jeff Gordon and "Star Wars" characters), sporting goods, toys, decorations, vintage crates and five full-size Pepsi machines. As for Lents' other favorite brands, a company man to the end, he said, "Mountain Dew, Gatorade, Aquafina and Frito-Lay." How long has your love affair with Pepsi been going on? According to my baby book, I had my first drink of Pepsi when I was 12 days old! How do you show your love for Pepsi every day? I work hard for the company every day to grow the business. I wear a Pepsi branded shirt almost every day (working or not) and show off my "museum" every chance I get! In the rare occurrence when I go into a restaurant that doesn’t carry Pepsi products, I proudly take in my own Pepsi beverage! 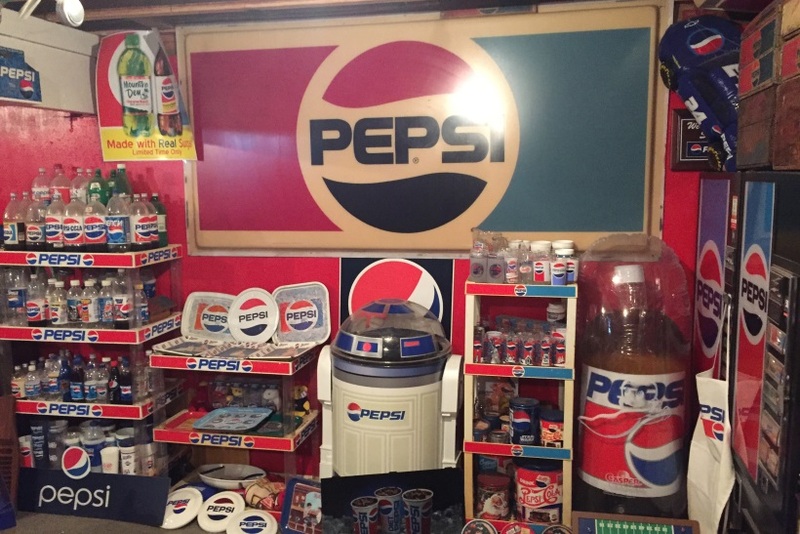 Every Pepsi item I have is cool—from a life-size Yoda to a Pepsi logoed, screen door push bar. What's the wildest thing you've done for Pepsi? When I was 16 and working in a local grocery store, I took home empty eight-pack bottle holders, cut out the side panels and covered my bedroom walls with them. What's the nicest thing the brand has done for you? Allowed me to make a comfortable living while doing what I love: promoting Pepsi and its vast portfolio for most of my working life. Will you ever retire from your love of Pepsi? I assume I will retire from the company at age 65, but I will still be a brand ambassador. I really don’t have a name; I’m just referred to as "the Pepsi Man!" 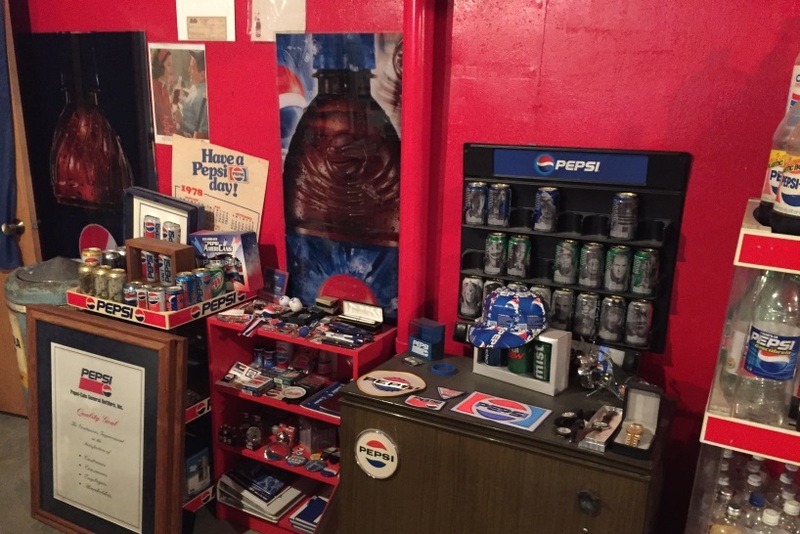 The ultimate retirement gift would be a lifetime supply of Pepsi products! Could anything make you disloyal to Pepsi? Is Pepsi Fire the next Crystal Pepsi?